“These are just some of the questions I get asked on a regular basis in my role as an Education Volunteer at the Ragged School Museum. I have been in this role for 11 months and have learnt that no two days are ever the same! This is whatI love about it. “I began volunteering with the Ragged School Museum after graduating with an MA in Contemporary British History. I wanted to gain experience working with young people in a heritage environment – I wanted to share my endless fascination for history and inspire others to learn more about it. I chose the Ragged School in particular because I love the way it allows visitors to use their imaginations in the Victorian Lesson experience with the terrifying Victorian teacher ‘Miss Perkins’ – and also allows visitors to handle genuine artifacts and pieces of history in our Victorian East End Kitchen. Both these elements really help bring to life the story of Dr Barnardo, his Ragged Schools and the children who attended them. “A typical day for me begins when I arrive at the museum at 10am. I meet with Danie, one of the museum’s Learning Officers, and we discuss the bookings for that day, and which workshops they will enjoy. Schools arrive fifteen minutes later, and whilst they settle in, Danie and I, along with ‘Miss Perkins’ meet with the class teacher to discuss the needs or requirements of the class. This is an important part of the day, as it allows us to be aware of the varying needs of the pupils – this allows us to ensure our workshops are as inclusive as possible. Classes take it in turns to attend a Victorian Lesson experience, or an object handling session with myself in the Victorian Kitchen. “I introduce myself to my first class and then lead them up the narrow and winding stairs to the top of the building. I then set about delivering the Victorian Kitchen workshop, educating the class about the home life of many of the children that would have attended this Ragged School more than one hundred years ago. I invite children to the front of the class to do a few 19th century domestic chores – such as washing, using the mangle, ironing and carpet beating! One lucky person gets to try out the tin bath for size too! We then split into groups and investigate a mystery object. At the end we come together again, and present our mystery objects to the whole class. This is a great session, as it allows pupils to work as historians; developing their investigative and communication skills, as well as encouraging team work. I believe it helps those pupils who may be nervous to feel comfortable to contribute to class discussion. The workshop will then be drawing to a close, so I take a few questions from the class. “At 11:30am, Danie prepares my class to go down to their next activity. I tidy the Victorian Kitchen up, and have a tea break in the museum’s cafe. I might help serve in the museum shop too. “At 12:15pm, I’m ready to start my second workshop with another class. We head up to the Victorian Kitchen for another session! Just after 1pm, the classes get ready to depart the museum. After waving goodbye to them, I take my lunch break. I might also use the time until my next session at 2:30pm to work on my individual project. I am currently helping to develop the museum’s Family Learning Programme, by creating a family trail. 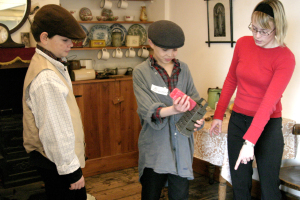 Our fictional Ragged Children, Annie and Arthur, guide families around the museum, giving them fun activities and challenges to complete.